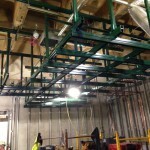 Unistrut Midwest offers installation services on all the products we sell. Our professional crews are trained on all of our product lines and provide high quality and fast installations on these products. Our crews adhere to the latest OSHA safety standards and carry their OSHA 30 hour cards.